Hearing loss in mammals is thought irreversible: damage wrought to ear hair cells can lead to permanent deafness. A new study in Neuron from Albert Edge and colleagues uncovers a potential drug that regenerates ear hair cells. Previous research demonstrated that this compound could generate ear hair cells from stem cells, informing the decision of these researchers to apply the drug to the cochlea of deaf mice. 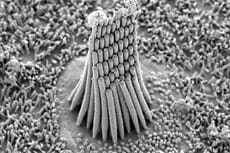 Imaging and other analysis showed hearing recovery and the growth of new ear hair cells. This may be a promising therapeutic pathway to help deaf individuals.